Hillsong Stockholm Sweden with Andreas Nielsen. Evil and pathologically lying “Hillsong Stockholm” in Stockholm, Sweden, explicitly excommunicated a Christian who is absolutely innocent in relation to each excommunication by all of Hillsong’s churches worldwide, and is absolutely innocent also to this particular Hillsong “church” in Sweden. Hillsong Stockholm physically evicted the innocent Christian from its church’s rented premises, and falsely accused the innocent Christian of harassment to Swedish Police. The typically manipulative, egocentric, psychopathic and pathologically lying HILLSONG senior pastor, Andreas Nielsen, absolutely refused to answer any questions; relating to his and Brian Houston’s practiced anti-Torsten policy, and their Hillsong Network global banishment against Torsten. Hillsong’s associated Swedish Pentecostal denomination, likewise, refused to explain their eviction and banishment against Torsten since 2002. One of several distinctions of satanic pastors of churches is an obsession to persecute God’s people, and to never repent. Satan is incapable of repentance, and so also are satan’s pastors of churches incapable to repent from their obsessive persecution against God’s people. Of all societal institutions in nations of Western civilisation, churchianity is the pinnacle of hypocrisy. The archetypically lying and manipulative pastors of the Hillsong empire and their pastors of HillSect Stockholm, Andreas Nielsen and Tobias Gard, are epitomes of such churchianity hypocrisy. HillSect Stockholm declares on its public website (http://hillsong.com/stockholm) that everyone is welcome, but reality of course differs from the falsehood of HillSect public statements. Not everyone is welcome. Torsten is especially not welcome. Similar to all HillSect pastors globally, also the HillSect Stockholm’s pastors have no respect for truth, love or justice. The HillSect entertainment-business churchianity brand have consistently demonstrated that the truth, love and justice are irrelevant. Ultimately, HillSect respects only HillSect. When Torsten has visited other HillSect campuses worldwide, all HillSect churches have obeyed Brian Houston’s anti-Torsten dictates and hence evicted and banished Torsten. And when Torsten has inquired with the evicting and banishing HillSect pastors why they have banished Torsten, none has provided any reality-based or Biblical reason, and all have refused communication. The first time Torsten ever visited Brian Houston’s Hillsong Church in Stockholm, Sweden, on Sunday July 3, 2016, HillSect Stockholm by action confirmed Hillsongs Network of Churches global banishment against Torsten through their employed Hillsong pastor Tobias Gard and their Hillsong securitypeople. HillSect Stockholm rents the renowned auditorium Cirkus in Sweden (http://cirkus.se/skandiascenen) for its Sunday staged entertainment-business churchianity. Upon Torsten’s visit to HillSect Stockholm with his mission to obtain confirmation of also HillSect Stockholm’s banishment against Torsten, and to inquire for a reality-based reason for their HillSect global banishment, their Hillsong securitypeople and pastors telephoned Sweden’s national Police with false accusations against Torsten of harassment and disturbance of peace. Torsten: "And what is the reason why you're asking me to leave?" Kent Medwin: "It is our policy at this stage that you are not free to attend services." Torsten: "Why am I banned from all ... Is it global is it?" Artie Shepherd: "It's any Hillsong Church." Torsten: "All over the world?" In all HillSect churches worldwide where Torsten has visited, the HillSect pastors have banned Torsten. When Torsten has asked these HillSect pastors why they have banned Torsten, none of the HillSect pastors have been able to provide a reality-based reason. Artie Shepherd: "If you actually want to talk to someone about this properly ..."
Artie Shepherd: "... then we can make a time to meet During the week and explain that. Ok?" 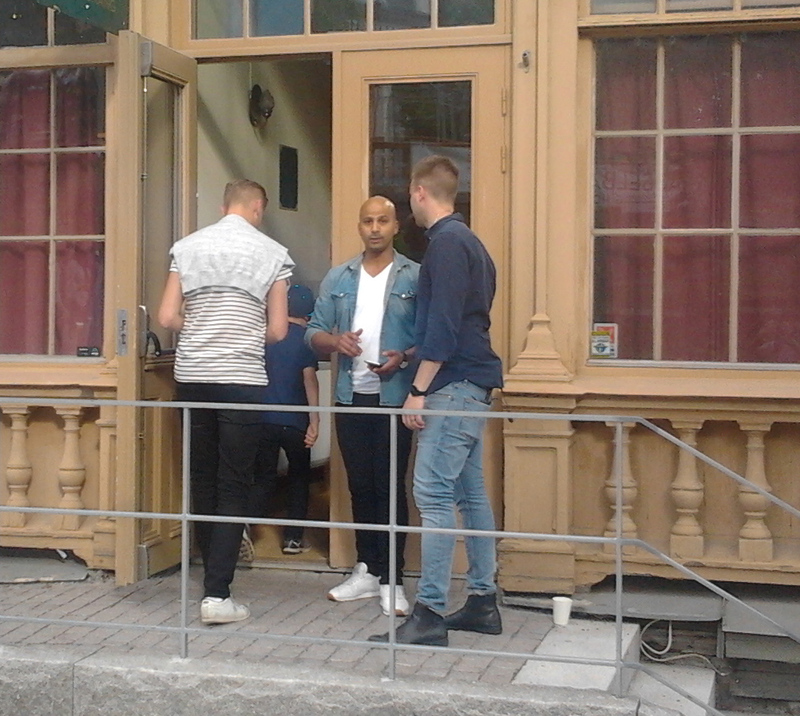 Torsten entered through the open front doors to the building of Skandiascenen Cirkus, which on Sundays is rented by the manipulative and deceptive “pentecostal” sect Hillsong Stockholm. The doors to the premises were wide open. Torsten stepped over the door threshold into the HillSect premises and stopped at one of the small tables, immediately inside the entrance hall. Two female greeters approached Torsten within seconds. 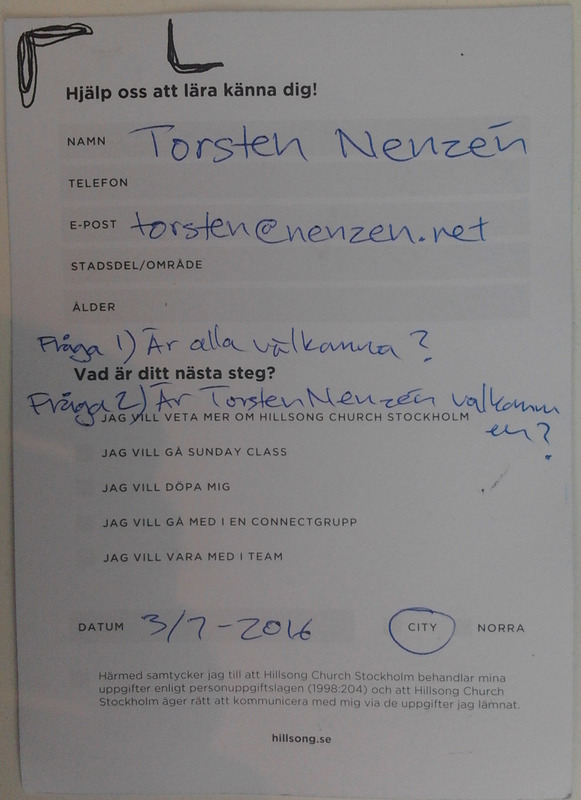 Torsten filled out one of the Hillsong visitor cards, which were placed on the small tables. Torsten photographed his filled visitor card before handing the visitor card over to the two female greeters standing on the opposite side of the small table (http://www.kyrkor.be/HillSect-Sthlm-visitorcard-2016-07-03.jpg). The greeters accepted the filled visitor card. Torsten then asked the two greeters if the person who is responsible for security is somewhere nearby. They turned around, and man then quickly approached Torsten. Torsten asked the man if he was the person in charge of their Hillsong security, and the man responded affirmatively. Torsten then took out his mobile phone from his shorts pocket, initiated an audio recording on the mobile phone device, and stretched his mobile phone towards the chest of the Hillsong man. Translation of selected parts of an audio recording of an anonymous Hillsong ‘securityman’ and a Hillsong Pastor Tobias Gard. TORSTEN: Are all people welcome to your gatherings? SECURITYMAN: I am not going to comment anything on a recording. TORSTEN: Am I welcome here? The security person walked towards the exit doors right behind Torsten. TORSTEN: We can go outside. SECURITYMAN: We are going to have our meeting here soon. If I can just ask you to leave. SECURITYMAN: I am not going to continue this conversation. TORSTEN: Who is responsible for security here? SECURITYMAN: I am not able to comment anything. SECURITYMAN: If I can ask you to go outside. TORSTEN: What is your name – you who are responsible for security? The anonymous security person pushed Torsten’s back gently in the direction towards the open exit doors immediately in front of Torsten. TORSTEN: What is your name? With whom am I speaking? Do you have a name? Who are you? SECURITYMAN: I am responsible for this meeting. I am going to ask you to leave. TORSTEN: An anonymous person asks me to leave. TORSTEN: Before I leave, can I just ask you to say who you are. What is your name? SECURITYMAN: I have no comment. TORSTEN: If you state your name, then I am going to leave your premises. TORSTEN: If you could just say your name? SECURITYMAN: I am not going to do that. TORSTEN: Is it a secret? TORSTEN: If you have authority to ask me to leave then you should state your name. TORSTEN: Before I leave I would like to know with whom I have spoken. SECURITYMAN: I am not going to reveal my name. TORSTEN: But then you have no authority, and you would have to call the police in that case. SECURITYMAN: Then I shall do so. The anonymous security person took out his mobile phone and called a number. He then stepped over the threshold to the exit door and onto public property outside. Torsten promptly followed behind him. The anonymous security man stopped a few meters away from the entrance on public property, and Torsten stopped there too facing the anonymous person from one meter apart. The anonymous person stood still, looking at his mobile phone, and Torsten stood still, observing the anonymous person in front. Finally, Torsten broke the silence. TORSTEN: Why are you so secretive? Why can’t you just say your name? SECURITYMAN: I feel very uncomfortable that you have a mobile phone that records my voice. Neither the anonymous security man nor Torsten had yet moved from their fixed positions opposite each other on public property. TORSTEN: Where are we standing right now? SECURITYMAN: We are standing on public property, and you are following me. After some time, the Swedish Police finally responded to the anonymous man’s telephone call. The anonymous security man then began to walk very slowly further away from their rented premises. Torsten accompanied next to the anonymously evicting security man as the man spoke with police, to hear what the man would say to police. After the anonymous Hillsong securityman’s lengthy introduction speech with the police on his mobile phone, the security man stopped and spoke instead to Torsten. SECURITYMAN: Would you please turn off that telephone? TORSTEN: I just asked a question if I am welcome, and you refuse to answer if I am welcome. The anonymous security person then held out his mobile phone towards Torsten’s mouth and said “The police wants to speak with you.” Torsten then stepped forward and leaned his head and ear against the outstretched mobile phone. Torsten and the Swedish police communicated through the anonymous person’s outstretched mobile phone. The Swedish police warned Torsten that Torsten may not harass people at their Hillsong church, according to law. When Torsten was initiating a rebuttal response to the allegation of possible harassment, the anonymous security person pulled his mobile phone away from Torsten’s ear. A second person approached Torsten while the anonymous security person was still speaking with police on his mobile phone. TOBIAS GARD: Hi Torsten! Do you recognize me? TORSTEN: Hi! Who are you? TOBIAS GARD: What are you doing? TORSTEN: Are you a member of this Hillsong? TOBIAS GARD: Are you doing an interview? TORSTEN: I am audio-recording, and that is for my own security. TORSTEN: Are you part of the leadership, or? TORSTEN: Ok. I don’t recognise you. Are you a pastor of this church? TOBIAS GARD: Yes I am. TORSTEN: I would like to know: Am I welcome to this church? TOBIAS GARD: I have to talk to “Modde” and ask what has happened. This seems peculiar. The Hillsect pastor Tobias Gard then turned to speak with “Modde”. SECURITYMAN: The police said that we have to ask him to leave. And then, if he wants to keep living, we will call them again. TOBIAS GARD: Ok, let’s do that. TOBIAS GARD: You just heard what “Modde” said that you are not welcome here. TORSTEN: You are a pastor; why am I not welcome? TOBIAS GARD: You will have to ask “Modde” about that, because I have such absolute respect for “Modde”. If we assess that we cannot have a person in our premises then that is fine. And then our conversation is over! Thanks. TORSTEN: You refuse to tell me why I am banished by your church? You refuse to say anything? The HillSect Pastor Tobias Gard and the anonymous Hillsong securityman walked away from Torsten. Torsten remained on the spot. Torsten turned off his mobile phone audio recorder. Torsten then walked towards the sidewalk along the public road opposite to the Stockholm HillSect rented premises of Cirkus. 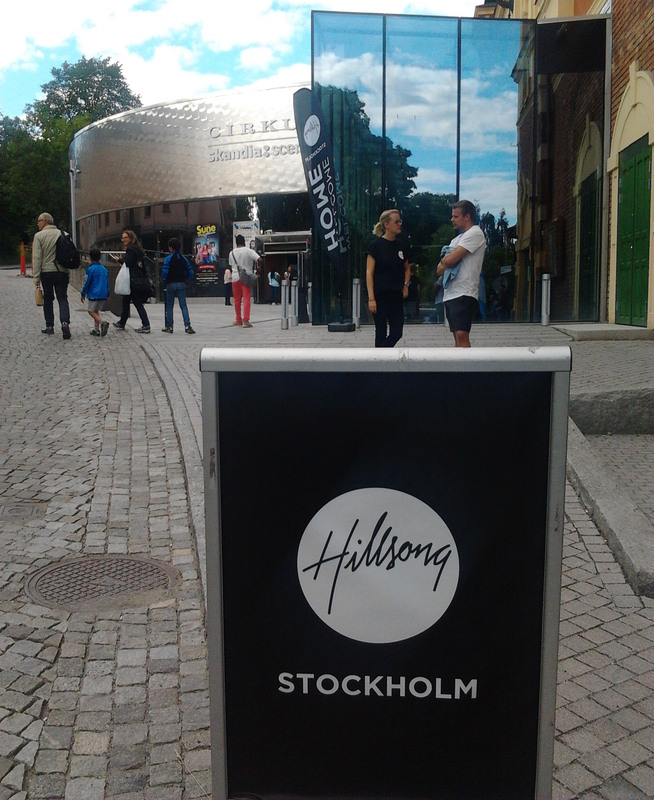 Torsten compositioned a photograph of the Hillsong road sign with the Hillsong Stockholm entrance in the background (http://www.kyrkor.be/Hillsong-Stockholm-2016-07-03.jpg). Torsten put away his mobile phone and stood alone on the public sidewalk opposite the HillSect rented premises. Within seconds, a man on a side entrance porch of the HillSect rented premises shouted at Torsten. Torsten then took out his mobile phone again, commenced an audio recording, and walked across the street towards the HillSect side entrance porch where the shouting man stood, wanting Torsten’s attention. TORSTEN: Yes. What do you want? GUARDSMAN: What are you doing? TORSTEN: Why do you ask me what I’m doing? Why do you have that hateful look in your eyes? TORSTEN: Why do you have a hateful look in your eyes? And why do you ask what I’m doing? GUARDSMAN: It looks like you’re harassing people. TORSTEN: Well, I’m taking a photograph of your sign. Harassing people? GUARDSMAN: I’m not asking about the photo. It looks like you’re harassing people. TORSTEN: Oh really? Ok. Who have I harassed? Who are you? GUARDSMAN: Can you please pick that away from my face. TORSTEN: You requested that I came to you. GUARDSMAN: No I ask you what’s going on. TORSTEN: Why do you ask? GUARDSMAN: Because you look like very suspicious. TORSTEN: I’m suspicious? Oh. A suspicious person. Who are you? The anonymous HillSect guardsman stopped talking to Torsten as he was entertained by additional HillSect security persons on the porch, and Torsten therefore walked back to the opposite sidewalk of the public road along the HillSect rented premises Cirkus. Torsten ended the audio recording and then photographed the harassing anonymous HillSect guardsman standing guard on their rented porch. After a short time the HillSect guardsman finished speaking with his HillSect security co-workers and then walked down the steps from the porch, crossed the public road, and further harassed Torsten. Torsten assumed that Torsten had correctly initiated a new audio recording on his mobile phone during the HillSect guardman’s harassment of Torsten, but an audio recording had never been correctly initiated, and therefore, that harassing conversation against Torsten is now missing its evidence. The harassing HillSect guardsman eventually departed from Torsten and resumed his post on the rented HillSect premises porch. Torsten remained in the same place opposite the HillSect premises for only one minute, before yet another man approached Torsten to speak with Torsten. The man was a member of HillSect Stockholm, and he acknowledged to also being a former member of ‘Stockholm Karisma Center’ where Andreas Nielsen previously was a pastor too. At the conclusion of the conversation with the former Charisma Center sect member, Torsten walked back to the main entrance of the rented HillSect premises at Cirkus to finally and formally confirm the HillSect global banishment against Torsten. Torsten initiated a final audio recording, lingered for one minute on the public plaza just outside the entrance doors to survey if any hostile person would rush up against Torsten on the public plaza. No one did, so Torsten then approached the doorsill of the premises and took one step inside. Immediately that Torsten stepped inside, a man who Torsten had observed standing guard opposite the door entrance inside, rushed towards Torsten and ordered Torsten to leave. RAUL: It was you who was not supposed to come in here, right? TORSTEN: Excuse me. You are shoving me?! Raul removed his hands from Torsten and discontinued his physical shoving against Torsten. TORSTEN: And you said ‘You are the one who isn’t supposed to be here’, is that what you said? RAUL: Yeah that’s correct. Wasn’t it so that we agreed that you are not welcome. TORSTEN: You did not say so. Am I welcome or am I not welcome? RAUL: I thought Tobias said so to you. Do you remember that Tobias outside said so to you? That you are not welcome. TORSTEN: So I am not welcome? RAUL: Tobias said so. I thought he was very clear and distinct about this. TORSTEN: He is referring to you. And then you are referring to each other. And that is also predictable that you refer to each other. TORSTEN: Am I welcome to your meetings: Yes or No? RAUL: No, you are not welcome. TORSTEN: Ok. Would you like to provide a reason why? RAUL: Right now you are disturbing the peace. TORSTEN: Would you like to say why? RAUL: I think you know why. TORSTEN: No. Would you like to declare a reason why? RAUL: You know that you are wrong. RAUL: You know that you behave inappropriately now. TORSTEN: No. Why am I not welcome? RAUL: You know that perfectly well. TORSTEN: You refuse to declare a reason why. RAUL: If I can just ask you leave. We have the right to say that you are not welcome. TORSTEN: Yes, you have the right to say. RAUL: Then I want you to just respect that. TORSTEN: Yes, but can’t you provide a reason why? RAUL: I don’t appreciate that you have a telephone in front of you. TORSTEN: But can’t you provide a reason why I am not welcome? RAUL: You promised that you would be outside. And you are not right now. TORSTEN: Can’t you explain why? TORSTEN: Ok, so you refuse to explain? You refuse to explain why? RAUL: I have nothing more to say. Raul took one step back from Torsten. And therefore, Torsten reciprocated and turned 180 degrees with his back against Raul and took one step out of the door, and continued walking straight off the neighbouring public property and away from that part of town. Why is Torsten banished by Hillsong Sweden? Fwd: Why is Torsten banished by Hillsong Sweden? Hello Hillsong’s Swedish lead pastor, Andreas Nielsen. As can be expected from typical Pentecostal and pathologically lying pastors, with the addition of the typical Hillsong somewhat psychopathic governance, you intentionally evaded to answer the Biblically necessary questions relating to Hillsong Sweden’s banishment and consistent evictions against the innocent person Torsten. On three occasions I have visited your Hillsong Sweden premises. On all three visits, Hillsong Sweden evicted me. On none of these three visits did I seek to disturb, but Hillsong Sweden’s leaders sought to quickly evict Torsten from Hillsong’s premises without any reality-based and justifiable reason. Hillsong Sweden refused to provide any reality-based and Biblical reason for Hillsong Sweden’s banishment. My purpose is to seek (and when necessary to expose) truth. On all three visits, I inquired if I am welcome or if I am banned also by Hillsong Sweden. Evidently, I am not welcome, and the evictions have nothing to do with any disturbing behaviour on my part, but has everything to do with the top leaders of Hillsong in Australia and subsequently with the top leaders in Hillsong Sweden. The Pentecostal pastor-liars of Hillsong Sweden, however, lack courage to speak this truth, and instead, your Hillsong Sweden falsely accuses innocent Torsten of disturbing your Sunday services. The actual disturbance for Hillsong Sweden is truth; and that Torsten asks. When Hillsong Sweden evicted me from Hillsong Stockholm’s premises on Sunday July 29 2018, what disturbance had I caused? I had caused zero disturbance. Twenty-three seconds after I had set my foot into your Hillsong premises, a Hillsong’s pastor was the first person to approach me, and without any initial greeting or introduction, as Hillsong’s fist statement, Hillsong’s pastor immediately requested that I leave. There is no coincidence to Hillsong Sweden’s evictions and banishment against innocent Torsten. Hillsong Sweden’s evictions and banishment against Torsten is clearly related to the evidenced testimonial facts: (1) that Australian Hillsong pastors have confirmed that the top leaders of Hillsong (Brian Houston) maintain a “policy” that Torsten should not be welcomed at any Hillsong Network of Churches worldwide, and (2) that the Australian Hillsong pastors have confirmed that Torsten is banned from attending any Hillsong church campus globally. Neither is there a coincidence of Hillsong Sweden’s banishment against Torsten, in view of the fact that every Hillsong campus globally has evicted or banished Torsten, and that every church worldwide that is connected with Hillsong Network of Churches also have evicted or banished Torsten. As typical Pentecostal and pathologically lying pastors, with the addition of the typical Hillsong somewhat psychopathic governance, Hillsong Sweden demonstrates that Hillsong Sweden’s pastors are not exceptions. Hillsong Sweden’s pastors obey the evidentially confirmed Hillsong Australia’s anti-Torsten “policy” and Hillsong Australia’s top leader order of global banishment against Torsten from all Hillsong campuses worldwide. Cowardly, Hillsong Sweden pretends that there is no connection between the above evidenced testimonial facts, and the evictions and banishment by Hillsong Sweden. TORSTEN: Ok. Tobias Gard. Varför är jag bannlyst? TOBIAS GARD: Så. Torsten, jag kommer att svara dig i veckan mailledes. Ja. Du kommer att få ett svar. Hillsong Sweden’s pastor, of course, again – lied! Hillsong Sweden did not answer truthfully. And, Hillsong Sweden did not answer the two recurring questions to Hillsong Sweden. (1) On what reality-based and Biblical grounds has Hillsong Network of Churches globally banished Torsten? (2) What specific sin or ill-doing is Hillsong Network of Churches and Hillsong Sweden accusing against Torsten? With typical churchianity-leadership dishonesty, Hillsong Sweden with Andreas Nielsen at the lead, falsely claim that Hillsong Sweden has banned me because I am a disturbance, while the truth is that I have caused no other disturbance than to simply ask the pastors of Hillsong Sweden why Hillsong Sweden has banned me. (1) On what reality-based and Biblical grounds has Hillsong Network of Churches globally banished Torsten? (2) What specific sin or ill-doing is Hillsong Network of Churches and Hillsong Sweden accusing against Torsten? Your Hillsong Sweden physically evicted me from your Hillsong church in Stockholm, in conjunction with my first visit to Hillsong Sweden on Sunday July 3 2016. On that day of my first visit, your Hillsong Sweden falsely reported to the Swedish Police against me, that I had been harassing your church and disturbing the peace. Subsequent to your Hillsong Sweden eviction and lies against me, you have received 44 email inquiries during two years until July 14 2018, as to provision of a reality-based and Biblical reason for your Hillsong’s banishment against the Christian person Torsten. You, Andreas Nielsen, and your Hillsong Sweden, and your supreme leader Brian Houston, have consistently refused to answer why Hillsong Network of Churches maintains Brian Houston’s global banishment against Torsten. In reality, Torsten is absolutely innocent of any wrongdoing in relation to your Hillsong Empire and in relation to all churchianity worldwide. In conjunction with my short revisit of inquiry at your Hillsong Sweden rented premises (this occasion at Vasateatern in Stockholm) on Sunday, July 22 2018, two years after my first visit to Hillsong Sweden on July 3 2016, I spoke with your Hillsong pastor Mr. Eric Liljero on July 22 2018. In the that brief conversation at your Hillsong Stockholm campus, on July 22 2018, your Hillsong Stockholm pastor promised (quadruple-assured) that your Pentecostal church, Hillsong Sweden, would inform me of your Hillsong’s reason for banishing me. Because your Hillsong Sweden did not reply to any of the eight email inquiries which Hillsong Sweden received, subsequent to your second eviction against me on Sunday July 22 2018, I revisited your Hillsong Sweden on Sunday July 29 2018, to inquire: (1) why Hillsong Sweden is still refusing to answer, (2) why Hillsong Sweden is still refusing to provide a reality-based and Biblical reason for your confirmed Hillsong global anti-Torsten policy, your Hillsong Sweden banishment, and your Hillsong global banishment of Torsten, which is enforced by all Hillsong Network of Churches globally. Your Hillsong Stockholm pastor, Tobias Gard, on July 29 2018, evicted me, assured that I am banned, and then promised that Hillsong Sweden would answer these questions within seven days. Transcription of recorded conversation between Torsten Nenzén and Pastor Tobias Gard of Hillsong Stockholm, on Sunday July 29 2018. TOBIAS GARD: Vi går ut! TORSTEN: Jaså. Vem är du? TOBIAS GARD: Jag heter Tobias Gard. TORSTEN: Har du fått mitt epost? TOBIAS GARD: Ja, jag har fått det. TOBIAS GARD: Jag ska svara dig. Kom så går vi ut. TORSTEN: Sparkar du ut mig nu? TORSTEN: Ok. Jag är inte välkommen. TOBIAS GARD: Jag vet att du spelar in det här. TORSTEN: Ja det är klart att jag spelar in som bevis. En sak bara: Ta din hand bort ifrån min kropp. TOBIAS GARD: Om du följer med ut så. TORSTEN: Varför är jag bannlyst? TOBIAS GARD: Kom så går vi ut! TORSTEN: Du har fått alla mail? TOBIAS GARD: Ja. Fått det. TORSTEN: Varför har du inte svarat hittills? TOBIAS GARD: Jag kommer att svara dig nu i veckan. TORSTEN: Ok. Så inom sju dagar, du lovar att svara. TOBIAS GARD: Jag lovar att svara Torsten. TORSTEN: Alright. Då sés vi. TORSTEN: Du, jag är inte välkommen här idag, eller hur? TORSTEN: Du, ta din hand bort ifrån mig! TOBIAS GARD: Ok. Bra. Du spelar in också. TORSTEN: Ja just, du får höra dig sen. Transcription of recorded conversation between Torsten Nenzén and Pastor Eric Liljero of Hillsong Stockholm, on Sunday July 22 2018. ERIC LILJERO: Hallå. Torsten, eller? TORSTEN: Ja ja. Exakt. Vem ar du? ERIC LILJERO: Eric Liljero heter jag. Jag är pastor här i kyrkan. ERIC LILJERO: Ja det stämmer. TORSTEN: Är jag fortfarande bannlyst av Hillsong? ERIC LILJERO: Vi kan gå ut. ERIC LILJERO: Är du här på Gudstjänsten, eller? TORSTEN: Ja exakt. Eric Liljero - pastor i … Visst är det inom Pingstkyrkan? Det är Pingstkyrkan Hillsong? TORSTEN: Och, är jag fortfarande bannlyst? ERIC LILJERO: Håller du på att spela in det här? TORSTEN: Det är bara för min säkerhet - så att säga. Man vet inte vem man blir påhoppad av. Är jag fortfarande bannlyst? ERIC LILJERO: Jag kan inte svara på det. Jag har inte. Det det. Det kan jag faktiskt inte svara på det. TORSTEN: Under ett års tid så har jag e-postat till Hillsong här i Stockholm och till Andreas Nielsen, för att få ett svar varför Brian Houston, och varför jag blev avvisad för ett år sedan när jag besökte. ERIC LILJERO: Vet du vad, vi ska få kika om det här. Kan vi göra så här. Gör så, du ska få min email adress, så kan du maila mig, så kan du och jag ha kontakt om det. TORSTEN: Har du ett färdigt ID kort? ERIC LILJERO: Nej det har jag inte. Men du kan få min e-post adress så kan du mejla mig, så kan du och jag, så ska jag ta reda på lite grann. Så kan vi samtala om det. TORSTEN: Kan du skriva ner det åt mig? ERIC LILJERO: Absolut, jag kan skriva ner åt dig. Bra. TORSTEN: Ska jag vänta här? ERIC LILJERO: Här. [https://bit.ly/2Nww5MU] Jag hittade inget bättre. Där har jag skrivit in ”Tobias Gard” som det bästa. TORSTEN: Tobias, Gard, at, nu ska vi se, hillsong punkt se. Ok jättefint. ERIC LILJERO: Skicka ett mejl dit så ska vi ta reda på det. TORSTEN: Du ska få min epost adress också. TORSTEN: Torsten at nenzen punkt net. Jag kommer att skicka dig ett epost redan idag, och min fråga kommer att vara: Varför blev jag utesluten-avvisad för ett år sedan? Varför är jag, det finns en bekräftelse på att Hillsong Network of Churches över hela världen har bannlyst mig, och jag vill veta varför. ERIC LILJERO: Gör så här. Skicka ett mail dit, så lovar jag se till att det kommer ett svar till er, tillbaks till dig. Tack så mycket för idag. Hej. As can be expected from a typical Pentecostal and pathologically lying pastor, with the addition of the typical Hillsong somewhat psychopathic governance, you intentionally evaded to answer the Biblically necessary questions relating to Hillsong Sweden’s banishment and consistent evictions against the innocent person Torsten. On three occasions I have visited your Hillsong Stockholm premises. On all three visits, Hillsong Stockholm evicted me. On none of these three visits did I seek to disturb, but Hillsong Stockholm’s leaders sought to quickly evict Torsten from Hillsong’s premises without any reality-based and justifiable reason. Hillsong Sweden refused to provide any reality-based and Biblical reason for Hillsong Sweden’s banishment. My purpose is to seek (and when necessary to expose) truth. On all three visits, I inquired if I am welcome or if I am banned also by Hillsong Sweden. Evidently, I am not welcome, and the evictions have nothing to do with any disturbing behaviour on my part, but has everything to do with the top leaders of Hillsong in Australia. The Pentecostal pastor-liars of Hillsong Sweden, however, lack courage to speak this truth, and instead, your Hillsong Sweden falsely accuses innocent Torsten of disturbing your Sunday services. The actual disturbance for Hillsong Sweden is truth; and that Torsten asks. When you, Tobias Gard, evicted me from your premises on Sunday July 29 2018, what disturbance had I caused? I had caused zero disturbance. Twenty-three seconds after I had set my foot into your Hillsong premises, you were the first person to approach me, and without any initial greeting or introduction, as your fist statement you immediately requested that I leave. There is no coincidence to Hillsong Sweden’s evictions and banishment against innocent Torsten. Hillsong Sweden’s evictions and banishment against Torsten is clearly related to the evidenced testimonial facts: (1) that Australian Hillsong pastors have confirmed that the top leaders of Hillsong (Brian Houston) maintains a “policy” that Torsten should not be welcome at any Hillsong Network of Churches worldwide, and (2) that the Australian Hillsong pastors have confirmed that Torsten is banned from attending any Hillsong church campus globally. Neither is there a coincidence of Hillsong Sweden’s banishment against Torsten, and the fact that every Hillsong campus has evicted or banished Torsten, and that every church connected with Hillsong Network of Churches also has evicted or banished Torsten. As a typical Pentecostal and pathologically lying pastor, with the addition of the typical Hillsong somewhat psychopathic governance, Hillsong Sweden and you Tobias Gard, demonstrate that you are not exceptions. Cowardly, you pretend that there is no connection between the above evidenced testimonial facts, and the evictions and banishment by Hillsong Sweden. Hillsong Stockholm and Tobias Gard: You lied! Again! You did not answer truthfully. And, you did not answer the two recurring questions to Hillsong Sweden. (1) On what reality-based and Biblical grounds has Hillsong Network of Churches globally banished Torsten? (2) What specific sin or ill-doing is Hillsong Network of Churches and Hillsong Sweden accusing against Torsten? With typical churchianity-leadership dishonesty, you falsely claim that Hillsong Sweden has banned me because I am a disturbance, while the truth is that I have caused no other disturbance than to simply ask the pastors of Hillsong Sweden why Hillsong Sweden has banned me. Genom det stora antalet brev som du har skickat till oss, till ledande företrädare för Pingströrelsen i Sverige, samt till personer i ledande ställning i de företag som hyr ut lokaler till Hillsong Church Sweden, där du förtalar Hillsong Church och dess företrädare, är vår bedömning att ditt enda uppsåt med dina besök vid våra gudstjänster är att störa och provocera vår verksamhet. Därför ber vi dig vänligen att inte besöka våra sammankomster framöver. In conjunction with my short revisit of inquiry at your Hillsong Sweden rented premises (this occasion at Vasateatern in Stockholm) on Sunday, July 22 2018, two years after my first visit to Hillsong Sweden on July 3 2016, I spoke with your Hillsong pastor Mr. Eric Liljero on July 22 2018. In the that brief conversation at your Hillsong Stockholm campus, on July 22 2018, your Hillsong Stockholm pastor promised (quadruple-assured) that your Pentecostal church, Hillsong Sweden, would inform me of your Hillsong’s reason for banishing me. Transcription of recorded conversation between Torsten Nenzén and Pastor Eric Liljero of Hillsong Stockholm, on July 22 2018. In conjunction with my short visit of inquiry at your Hillsong Stockholm rented premises of Vasateatern, on Sunday, July 22 2018, I spoke briefly with your Hillsong pastor Mr. Eric Liljero. In the brief conversation at your Hillsong Stockholm campus, on July 22 2018, your Hillsong Stockholm pastor quadruple-assured that your Pentecostal church, Hillsong Stockholm, would inform me of your Hillsong’s reason for banishing me. We spoke briefly earlier today, Sunday July 22 2018, in conjunction with my short visit of inquiry at your Hillsong Stockholm rented premises of Vasateatern. Firstly, thank you Eric Liljero for having taken a few minutes of your time to communicate directly with me. In our brief conversation earlier today, which is transcribed here beneath, you quadruple-assured to me that you would correspond with me, with regards to provision of the reason why your Pentecostal church, Hillsong Stockholm, has banished me. (2) What specific sin or ill-doing is Hillsong Network of Churches, and Hillsong Sweden, accusing against Torsten? ERIC LILJERO: Här. Jag hittade inget bättre. Där har jag skrivit in ”Tobias Gard” som det bästa. Sektledaren från Karisma Center, Andreas Nielsen, på Vasateatern. Fwd: Sektledaren från Karisma Center, Andreas Nielsen, på Vasateatern. Sektledaren från Karisma Center, Andreas Nielsen, nu på Vasateatern. Sektledaren från Karisma Center, Andreas Nielsen, nu på Cirkus. Egocentrerade och manipulativa sektledaren från Karisma Center; Andreas Nielsen. Det har framkommit samstämmiga uppgifter via olika personer globalt att Hillsong Network of Churches praktiserar en global anti-Torsten policy; innefattande att Torsten är av Hillsong bannlyst av samtliga Hillsongs kyrkor globalt. I alla Hillsongs kyrkor globalt där Torsten har satt sin fot, har Hillsongs pastorer bannlyst Torsten. När Torsten har frågat dessa bannlysande Hillsong pastorer varför de har bannlyst Torsten har ingen av Hillsongs pastorer kunnat ge något verklighetsgrundat skäl. När jag första gången någonsin besökte din och Brian Houstons Hillsongkyrka i Stockholm, söndagen den 3:e juli 2016, bekräftades Hillsongs globala bannlysning mot Torsten genom att din anställda kyrkopastor Tobias Gard avvisade Torsten ifrån er abonnerade samlingslokal vid Skandiascenen Cirkus, och Hillsong Stockholm ringde samtidigt till Polisen och anmälde Torsten för trakasseri. (1) Varför har Hillsong Network of Churches bannlyst Torsten globalt? (2) Specifikt, vad anklagar Hillsong Network of Churches mot Torsten? När jag första gången någonsin besökte din och Brian Houstons Hillsongkyrka i Stockholm, söndagen den 3:e juli 2016, bekräftades Hillsongs globala bannlysning mot Torsten genom att din anställda kyrkopastor Tobias Gard avvisade Torsten ifrån er abonnerade samlingslokal vid Skandiascenen Cirkus.